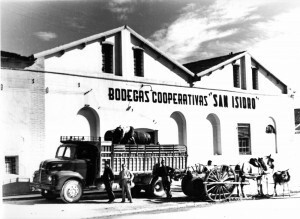 BSI-BODEGAS SAN ISIDRO was founded in 1934, on the historical background of the Spanish Civil War, by a group of winegrowers (more than 400 people at present) who, with big efforts, made this winery become one of the leaders in wines production and sales within the Jumilla Wines Denomination of Origin Council, since it was created in 1966. It is located in Jumilla, in the South-East of Spain, a land with more than 5000 years of Wine History dating back to the Iberian period, and which is a product of the magic combination of a continental climate softened by the proximity to the Mediterranean coasts, with rainfalls that are similar to the desert ones (less than 40L. per year), cold winters with frequent frosts, hot and dry summers where temperature rises up to 40ºC., limy soils which are strong enough to resist to plague attacks, as well as the orientation of vineyards, mostly from rain-fed agriculture. BSI counts on more than 3500 hectares of vineyards, and most of them could be considered as from Organic Cultivation, with low yields and really high qualities that give, as a result, wines with intensity of color and aromas, complexity and structure, and all this allows BSI to produce a really wide range of different wines that can adapt to all palates.